We often talk about January being a month of new beginnings. It’s the start of a brand new year and time to clean out the cobwebs to create a brand new slate for the upcoming 12 months. January is the month of fresh starts, but can it also be the month of fresh fragrances, even though it really is very cold out there? I definitely think so, but only if that freshness is served with a healthy serving of fun on the side! Moschino has always been a fun fashion house. They famously made a collection of clothing inspired by Popeye’s best beau, Olive Oyl, not to mention the fact that their iconic Cheap & Chic fragrance comes housed within a bottle that resembles this unlikely style icon. With Moschino’s sense of fun, it’s no surprise that they appointed Jeremy Scott as their Creative Director – he’s a cartoon superhero who loves kitsch iconography and he’s a man knows how to serve a look. 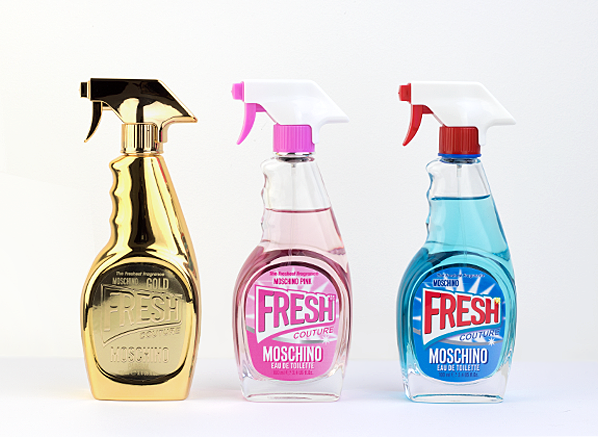 Jeremy Scott has found a perfect home at Moschino, turning his eye not only to the fashion, which he has pushed to extraordinarily cheeky lengths but to perfume too, creating fragrances in a host of unusual bottles. When he’s not putting perfume inside teddy bears, Jeremy Scott is taking the most benign and dull of objects, and putting something fragrantly luxurious inside. I am, of course, referring to Fresh Couture – the fragrance collection that takes wonderfully wearable and fresh scents, and plants them in the most unlikely of vessels: a bottle of household cleaner. In this post we’re looking at the Fresh Couture collection, starting with the funky original and finishing with the bling-tastic new Gold Couture. 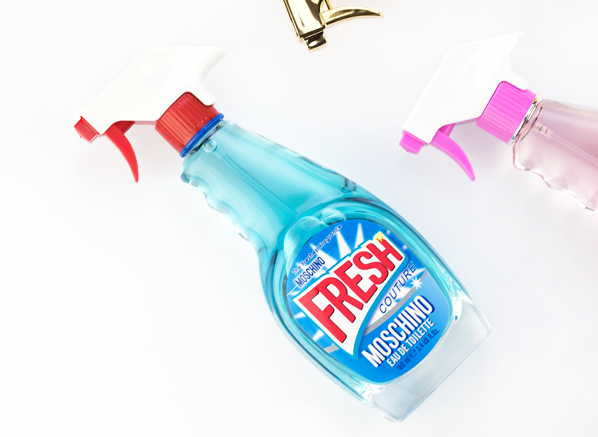 It’s time to get Fresh with a capital F! You might pick up the blue household cleaner bottle of Fresh Couture and expect some sort of sick, twisted joke, waiting for a truly filthy, animalic fragrance to jump out of the bottle, leaving you desperately in need of the bleach the bottle leads you to believe is within. But rest assured, all of the humour and fun is reserved solely for the presentation which, let’s face it, is truly remarkable. 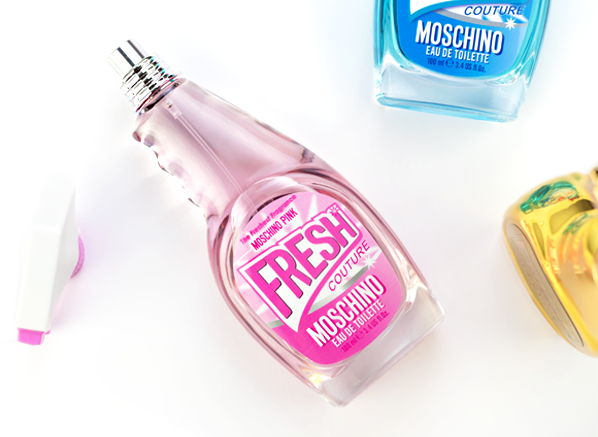 Fresh Couture the scent is exactly what it says on the tin – sorry, on the bottle – a clean, fresh and delightful fragrance with a touch of luxe. Fresh Couture is a modern musky floral done in the abstract style. It doesn’t smell of any one particular fruit, flower or musk, instead, it just presents an impression of these three key themes. The top notes are sparkling and dewy, with a hint of something sharp, whilst the heart is all rain-soaked petals and spiky green stems. In the base, Fresh Couture is all about cool, breezy musks, with a touch of something woody to bring a hint of warmth. As far as achieving what it set out to do, Fresh Couture ticks every box – it’s undeniably refreshing, and enviously couture. Pink Fresh Couture is a celebration of juiciness. It opens up fruity and, no surprises here, very pink. Now, in perfumery pink things have a tendency to be sickly sweet, but the operative word here in the name of this ode to pinkness is ‘fresh’, so it’s no surprise that Pink Fresh Couture is still dazzling and bright. The pink quality comes through in the form of grapefruit and pomegranate, with the latter giving a drinkable, aqueous feel, whilst the former brings a refreshing zing. It’s all expectedly fun and fruity! From then on, this pink edition of Fresh Couture subverts the themes of the original by switching out abstract white flowers for a delicate, blush rose accord. It feels like a dewy morning rose caught at dawn whilst the air is still cool. It’s really pretty and it’s supported by Fresh Couture’s signature, breezy musks, with an added touch of mineral ambrox for some extra lift. Pink Fresh Couture is for you if you love the idea of a pretty, wearable rose spritzed from the coolest bottle on the planet. 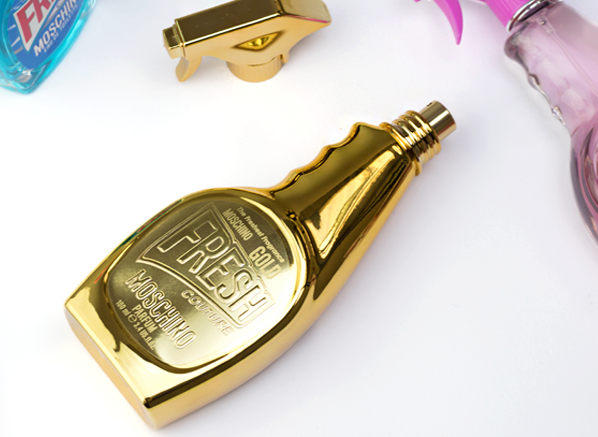 The idea of a functional object turned luxe is most prominent in Fresh Couture’s gold edition, which is easily the most decadent and high fashion fragrance in the trio. It’s also the most divergent of the bunch, leaning starkly towards the idea of couture as opposed to freshness. But fear ye not, there’s still much freshness to behold here, it’s all just a little bit more, well, golden I suppose! Gold Fresh Couture is a warm, floral oriental with a subversive twist. First off, there’s a fun dollop of peach compote, which makes one thing of juicy cocktails by the beach. Then there’s a beautiful bounty of florals – the likes of jasmine, lily of the valley and golden chain orchid, each with a range of contrasts (green, spicy, waxy etc) – served in a heady spritz of freshness. Then, to finish it all off, Gold Fresh Couture serves up a beautiful milky texture that is bold and exotic. It’s actually a really intriguing composition that’s as excessive and as luxurious as its packaging. No purchase necessary. A purchase will not improve your chances of winning. Contest begins 25th January 2018 and ends 8th February 2018. Five winners will be selected in a random drawing on or about 8th February 2017. Five prize winners will each receive one 50ml fragrance. If the winner doesn’t respond within 7 days, the competition will be redrawn. Prizes must be accepted as awarded; not redeemable in cash or credit. This entry was posted on Thursday, January 25th, 2018 at 6:07 pm and is filed under Candy Perfume Boy, Fragrance, New products, Spotlight On. You can follow any responses to this entry through the RSS 2.0 feed. You can skip to the end and leave a response. Pinging is currently not allowed.